I did some more Census research at Rutgers last week. I found Raffaele De Rosa in both 1900 and 1920, neither of which I had before. In 1900, he was listed as Robert De Rosa, and his wife was Bepina or Pepina, presumably a diminutive for Giuseppina. Their first son, John, had been born by that point, and was five months old. His birthdate was listed as Jan 1900. Raffaele's was shown as March 1879, and Giuseppina's as Sept 1881. They were living at 38 Cross Street in Paterson. Raffaele is listed as a watch maker. Nobody else in the family had come to America yet as of Census time in 1900. In 1920, Raffaele and Giuseppina and their family were living at 95 Market Street, and Raffaele was working as a musician. No new children since the 1915 Census. Raffaele's parents (Laura's great-great-grandparents) "John" and "Lucy" (Giovanni and Lucia (Nannariello) De Rosa) were living with them. Giovanni was working as a blacksmith; I can't read where, though. Raffaele owned the house. There were two other families living at the address, renting parts of the house. Philip Saracco and his wife Frances (De Rosa) (otherwise known as Filippo and Francheschina) were living at 38 Ward in 1920, in a house that they owned. Filippo had gotten naturalized in 1898. All of their children were born by this point, with the most recent addition being Victoria. Aunt Vic, of course, is still alive, the only one of the children who is. Filippo was still a loomfixer in the silk mills, and the two oldest children, Josephine, age 16, and Sebatian, age 15, were working as weavers in the mills. Aunt Jo, of course, eventually went to college and became a teacher, and passed away in July 2000. Out in Prospect Park, the Sisto and Felicia (Minnocci) Pantano family was living on Haledon Avenue in a house that they owned. Sisto was still making shoes. The children were listed as John, age 12, Lena, age 10, Annie, age 9, daughter Louise, age 7 (that's a mistake; it should be son Louis), and Mary, age 5. There was also a boarder, Ettore Santucci, who worked as a shoemaker, possibly in Sisto's shop. Part of the house was rented out by another family, the Seidels. I looked for Filippo Saracco in the 1895 New Jersey state Census, but haven't found him yet. He wasn't in wards 3, 6, 7, or 8. Next time I go to Rutgers, I'll page my way through wards 4 and 5; 5 seems like a likely possibility. There didn't appear to be many Italians in the other wards, mainly English and Irish and the like. Maybe there just weren't many Italians in Paterson period in 1895. On Friday, Laura and I drove up to Cedar Lawn Cemetery in Paterson to try and find the graves of her great-grandparents, Giovanni & Lucia (Nannariello) De Rosa. The cemetery is so huge that we needed to go up at a time when the office was open so they could show us where the site was on a map. Yeah, that's almost too easy. :-) Anyway, the lady in the office was very nice, gave us a map and even copied their records for us. That was really helpful, because the Interment Name Index cards for Giovanni and Lucia had plenty of information we didn't have. For example, Lucia's name was actually Maria Lucia. Both Giovanni and Lucia died in 1924. Lucia died first, on 19 March 1924, and was buried on the 22nd. She died at home, 150 Fair Street in Paterson, of Lobar Pneumonia. Their son Raffaele bought the plot on the 21st of March, according to the Lot and Grave Index card. Giovanni died later that year, also at home on Fair Street, on 23 Nov 1924, of Arterio Sclerosis, and was buried on the 26th. We looked to see if we could find a grave for Raffaele and Giuseppina, but we didn't have any luck, and I didn't want to press the lady in the office, especially since it was lunch time and she had to go out. After going to the cemetery, we stopped by Laura's parents' house to show them what we'd found. Laura's mom mentioned that her mother, Laura's grandmother, Adelina Saracco, was sick as a child (I think she was about three years old) with some kind of kidney problem, and that she went to live with her grandparents, Giovanni and Lucia, for a few years while she got better. We were curious, since Raffaele was a watchmaker and jeweler, if there was any jewelry in the family that he might have made. Laura's mom said that she does have something that belonged to Mama 'Cia, but we didn't see it. We went up to Laura's parents' house yesterday to celebrate Laura's birthday, and while we were there, we went tramping through cemeteries in Paterson again. First we went to Calvary, where Laura's mom laid a grave blanket on the Pantano grave. While we were there, we wanted to find the graves of Vittorio and Anna (Magliocchetti) Minnocci, Laura's great-great-grandparents the macaroni manufacturers. I had a number (Section 3, grave 365), but there didn't seem to be any markings for which section was which. While we were there, Laura's mom remembered that when she was a girl, her father used to take her to the cemetery to visit his grandparents' grave, and that it was by the fence. So I walked the section of the cemetery by the fence bordering Cedar Lawn cemetery, and eventually found the grave. Anna Magliocchetti, Laura's great-great-grandmother, lived from 1863-1959, which means she was 95 or 96 years old when she died. Vittorio is listed as having lived from 1861-1934. We knew the 1934 date. Somewhere, I had found a birthdate for him of 3 Sep 1863, but I can't tell which of the sources for his birthdate showed that. So perhaps more research is warranted there. While walking the cemetery, I also found another Minnocci grave. This one was for Ottorino and Vienna. Laura's great-great-uncle was named Arthur O. Minnocci, and his wife was named Vienna, so I think this is them. Ottorino/Arthur is listed as having lived 1895-1957, and Vienna from 1895-1976. Laura's mom says she remembers her Aunt Vienna. I had birthdates for them from the 1915 New Jersey state census that match pretty closely; Arthur was listed as born in July 1894, and Vienna in September 1895. So I'm pretty sure this is them. After we were done there, we wandered around next-door Cedar Lawn for a while, looking for Giovanni and Lucia (Nannariello) De Rosa. Aunt Vic had said she remembered that their grave was on a little hill. Unfortunately, the cemetery is filled with hills. We walked one, but it was cold and was going to be getting dark before long, so we decided to try again on a day when the cemetery office was open and they could pinpoint the grave for us on a map. On our way out, we saw a De Rosa headstone by the side of the street, but it was for a different group of De Rosas, who all seemed to change their name to De Rose. I should have taken pictures so I knew who it was, but there didn't seem to be any connection to Laura's De Rosas. Next time I'll take pictures and notes. Laura's great aunt Vic says that Giovanni and Lucia De Rosa are buried in Cedar Lawn Cemetery in Paterson, and that Giovanni died when she (aunt Vic) was 7 or 8 years old, so that would make it in about 1925-6. So I called Cedar Lawn back today to find out where they are. They're in Section 4, Lot 327B. The map on the Passaic County Historical Society, Genealogy Club web site doesn't break the cemetery down by section, so it's not much help. I guess we'll have to wait until we get there. The lady on the phone said that the office is open from 8:30 to 4 on Saturdays; unfortunately, we almost always go up to Laura's parents' house on Sundays, and they're not there then. So maybe we'll go up some Saturday and let them show us on a map where they are. Or maybe we'll go on a Sunday and wander around until we find them. I also called Calvary Cemetery to find where Vittorio Minnocci and his wife Anna are buried, since Vittorio's death certificate said he was buried there. They're in Section 3, Grave 365. No map available there, but it's a lot smaller than Cedar Lawn; I'm sure we'll be able to find it. "He smiles. 'And of course the 33rd-degree piercing would have to be a very private piercing,' he says. 'Only 33rd-degree Masons would know where that piercing occurs.'" I found one new item when I was at the Family History Center. I mentioned below that I hadn't yet found a death record for Domenico Manzo, my 6G-grandfather. Now I have. He died on 11 Nov 1822 at the age of 70. That means his widow, Marianna Altieri, survived him for almost 20 years. His parents were listed as Carlo Manzo (7G-grandfather) and Porzia Piazza (7G-grandmother). Interestingly, earlier this week Larry Sennello had sent me scans of some pages showing birth or baptism dates for Piazzas from 1697 to the 1760s. He wanted some help checking his interpretation of the text; the numbers in particular were very difficult to read. It's damned near impossible to tell the difference between a 1 and a 2, and 7 is pretty close too. At the time I didn't know of any Piazzas in my tree, but I was happy to do the proofreading. So one day after I send my interpretations back to Larry, I find out that I do indeed have a Piazza in there. Looking at the scan and Larry's transcription, there's a Porcia Dorotea Piazza born on 10 or 11 Oct, 1712 or 1717 (I said that the numbers were a bear to distinguish). If the entries are in order, and they all appear to be, then it should be 1712. But the last number really looks like a 7, except that it's missing the little cross-bar that most of the other 7s have, so it's probably a 2. Anyway, I don't know if this is my 7G-grandmother or not. She would be an appropriate age to have a child in 1751, and I don't see any other candidates in the list of Piazzas, so it probably is, but I need more proof tieing this birth to the mother of Domenico Manzo. But if she is the right person, then Domenico Piazza and Antonia di Biase are my 8G-grandparents. Here's a bit of housecleaning from my big roundup of the past week or so. I mentioned that I hadn't made a copy of the marriage record for Angiolo Pietrosimone and Anna Antonia di Luisi. Now I have, and I remember why I hadn't before. This thing is a mess. I've done some substantial cleanup work on it, and I can now read a fair portion of it, but it's still pretty brutal. You can look at page one and page two and see what I mean. I still can't tell exactly when they got married from this, but the index said 12 March 1818, so I'll go with that since it's unreadable on the record itself. There's something about 16 Jun 1815 or 1818 at the bottom of page one; I'm not sure what that's about yet. I need to find my copy of Trafford Cole's book about Italian records to help decipher the whole record. Anyway, I do know that it gives Angiolo's parents as the late Giovanni and the still-living Vittoria Masuccio and says that he's their eldest living child and 32 years old, and gives Anna Antonia's parents as the living Antonio and the late Francesca Bianchino. She was 22 years old and the eldest living child of her parents. The banns were read on the 1 Mar and 8 Mar, and I don't think anyone objected. Their witnesses were Luigi Antonucci, Marino Pito, Giuseppe Ferrazza, and Francesco del Toro. I also didn't have copies of Antonio Rapa's death record when I wrote the roundup. I've since gotten them. There are two pages. The first is a handwritten addendum to the records completely out of the normal format of the death records. It's basically a copy of the death record from Piedimonte, before the mayor of that town, N. Onoratelli. It says that he died in the "Casa di detenzione" of that town, which I take to mean jail. I know it's the right Antonio Rapa, because it says he's the husband of Angiola d'Amato. I think they've got the age wrong, though; it says he was 70 years old, where my records say he was only 56. But I'm willing to give a little slack for a record in another town. The second death record is the account of San Potito's mayor in the form of a regular death record, where instead of people appearing before him, he says he received a death record from the mayor of Piedimonte on 16 Nov 1816 that detailed the death of Antonio Rapa, husband of Angiola d'Amato and son of the late Domenico Rapa and Cecilia Missere, while detained in the jail ("detenuto nelle carcieri") of Piedimonte on 20 Sep 1816. I am really curious what he was doing there, and wish I knew more Italian to understand what the nuances are of the language describing where he was, whether it's jail or prison, whether this was something like he was in the drunk tank overnight and died or whether he was serving a sentence or what. I called Cedar Lawn cemetery in Paterson today to see if they had John/Giovanni De Rosa buried there. They asked for a death date. I don't have one, but they wanted one, so I guessed 1915-1920. They called me back later to tell me they didn't have him there. Laura's mom says they might be in Laurel Grove in Totowa, and that she'll ask Aunt Vic this weekend. We should ask her to ask Aunt Vic if she knows when the De Rosas died, too. 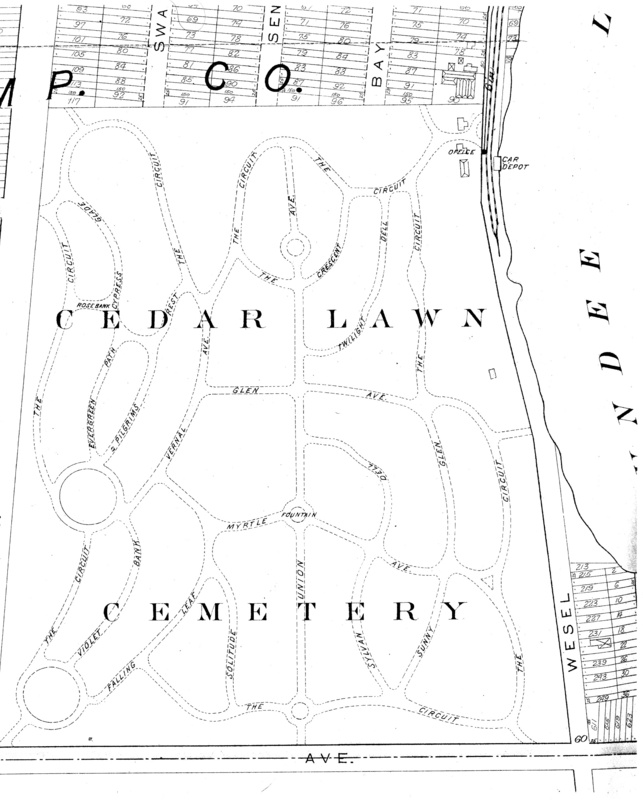 It's possible that the rest of Laura's De Rosas are buried in Cedar Lawn Cemetery in Paterson. I did a search on Google for "Totowa cemeteries" and came up with a bunch of pages, including some about cemeteries in Passaic county from the Passaic County Historical Society Genealogical Club. One of those pages is a list of people who owned plots at Cedar Lawn in 1917. And one of those plot owners was Raffaele De Rosa. They also have a page detailing how to get cemetery records from Cedar Lawn. I guess they're one of the big cemeteries there and get a lot of requests, because they apparently charge $25 for the search. It turns out that Cedar Lawn is right next to Calvary, where we visited on Thanksgiving. The PCHSGC site also includes a brief article about the immigrants who came to work in the silk factories. I wonder if Laura's relatives participated in the strike of 1913. I also found an interesting site devoted to the history of Paterson. And to finish off this summary of what I've found since April, charts to summarize what I've found. Here they are. As the last time, the waterfall chart is smaller, and shows only direct ancestors. The left-to-right chart shows all relatives that I've found, and highlights direct ancestors in bold type. One addition this time is that each person has their relationship to me shown directly underneath their name. When I made up my last chart in April, I knew very little about my 4G-grandparents Angiolo Pietrosimone and Anna Antonia di Luisi. That's mostly still the case for Anna Antonia. I knew she had been born around 1798, and that was it. In searching the death records of San Potito, I found that she had a short life. She died at the age of 22, on 5 Jan 1821. She had been born in Piedimonte d'Alife to Antonio di Luisi and the late Francesca Bianchino. She had worked as a peasant farmer. Looking through the marriage records of Piedimonte, I found that Anna Antonia and Angiolo were married on 12 March 1818 in that town. I need to do some more work on deciphering what the marriage record said, and unfortunately, I haven't yet made a copy of it, only abstracted the most important bits. I haven't been able to find either Antonio di Luisi or Francesca Bianchino in the death records of Piedimonte d'Alife yet, but I'm still working on it. It's interesting; I've been working in the records of San Potito long enough that I know many of the surnames in the village and can read the handwriting pretty easily. But just one town over, it's a whole new ballgame. The handwriting is different, many of the surnames are different. It takes a while to get accustomed to reading the records of a new town. Anyway, with Anna Antonia being born around 1798, Antonio di Luisi and Francesca Bianchino must have been born no later than about 1780. Antonio died some time after the death of his daughter on 5 Jan 1821, and Francesca at some time before the marriage of her daughter on 12 March 1818. But because they're all from Piedimonte, the Census doesn't give me much help, and the records from Piedimonte haven't yet revealed their secrets. So that's as far as I've gotten there. Angiolo Pietrosimone is somewhat different. I knew he had been born sometime around 1786 and had died sometime before his daughter Maria (my 3G-grandmother) had gotten married in 1841. I found his death record on 29 Apr 1832. It listed his wife as Maria Giuseppa di Fondi, but it also listed his parents as Giovanni Pietrosimone (5G-grandfather) and Vittoria Masuccio (5G-grandmother), the same parents as listed on the marriage record with Anna Antonia di Luisi, so I knew I had the right one. His brother Vincenzo was one of the people who reported the death to the authorities. He was listed as 46 years old, which matches what I knew about his birthday occuring sometime around 1786. At the time of Angiolo's death, his father had already died, but his mother was still living. I went looking for Giovanni's death record, and believe I've found it. He died on 18 Mar 1815. Unfortunately, 1815 was a year where the records were completely handwritten, as opposed to being entered in pre-printed forms, and some of the information usually provided wasn't. For example, it only lists Giovanni's father's name, not his mother's name. There was a connection in that Angiolo was one of the people who reported the death, and it specifically says Angiolo was Giovanni's son. It also said that Giovanni's father was Agostino Pietrosimone (6G-grandfather). But I needed to go to the Census to firm this up. Here I found Giovanni Pietrosimone, son of the late Agostino, married to Vittoria Masuccio. So there's the connection. Giovanni was born on 28 Dec 1753 and worked as a peasant farmer. Son Angiolo, my 4G-grandfather, was born on 11 Feb 1786, in exactly the year I expected him to be born. Angiolo's brother Vincenzo was born on 14 Feb 1788. Sister Teresa was born on 8 Jul 1790. Brother Giovannbattista was born on 10 Apr 1793. Brother Pasqualantonio was born on 14 Jul 1795. And sister Mariantonia was born 17 Jun 1798. Since Agostino was already dead by 1802, I couldn't look any further for him. With Giovanni being born in 1753, that would mean Agostino would have been born no later than about 1735. Vittoria Masuccio was also mentioned in this entry. They didn't give a birthdate for her for some reason. They list her as 31 years old here, but that would have made her 15 years old (born abt 1771) when she had Angiolo, and that seems very uncommon in this area at this time. I found her death record on 12 May 1832 (less than two weeks after her son Angiolo Pietrosimone) in San Potito, and it says that she was 60 years old at the time, which would put her birthdate at about 1771-2. So it's possible. The census listed her father as Michelangelo Masuccio (6G-grandfather), and her death record did the same. Her mother was Anna Maria Paterno (6G-grandmother). Both were dead by the time she died in 1832, but Michelangelo had been dead at least 30 years by then, as he was also listed as deceased in the 1802 Census. Anna Maria, on the other hand, was alive in 1802, and living on Strada Chiesa Nuova. In 1802, she was listed as the second widow of Michelangelo Masuccio; I assume that means the widowed second wife, because it would be very difficult for him to leave two widows legally. :-) She was 64 years old in 1802, which would place her birthdate around 1738, and was born in Piedimonte d'Alife. She had three of her children living with her. Teresa was born 19 Aug 1772. Silvestro was born 30 Dec 1780. And Mariagiovanna was born 19 Jan 1784. So it would appear that Michelangelo died sometime between 1783 and 1802. I also found two other siblings in the death records and Census: Pietro was born 23 Apr 1764 and died 21 Aug 1846. Angiola Masuccio was born on 7 Jun 1766 and died on 5 Nov 1833, having married Giacinto Scappaticcio and Pasquale Nigro. Michelangelo must have been born sometime before the mid 1740s. Anna Maria Paterno was listed in the Census as the daughter of Giuseppe Paterno. I went back to the death records, and sure enough, there she was, widow of Michelangelo Masuccio and daugther of Giuseppe Paterno (7G-grandfather) and Camilla Simonetti (or Simonelli, 7G-grandmother), dead on 13 Jul 1829. She was listed as 90 years old in 1829, which matches with the Census's birthdate of about 1738. Formidable, especially at a time when life was often nasty, brutish and short, in the words of Stephen Jay Gould. That means that Giuseppe and Camilla must have been born no later than about 1720. The only ancestor from this line I've traced back further than that was Giovanni d'Amato, born no later than about 1714. Here's a chart showing Anna Antonia di Luisi's ancestors, and another one showing Angiolo Pietrosimone's ancestors. With that, I'm all caught up on how far I've come since the last major summary in April.